State Senate candidate Tom Sullivan talks to prospective voters Tuesday evening at the Howard Beach Lindenwood Civic Candidates Forum. 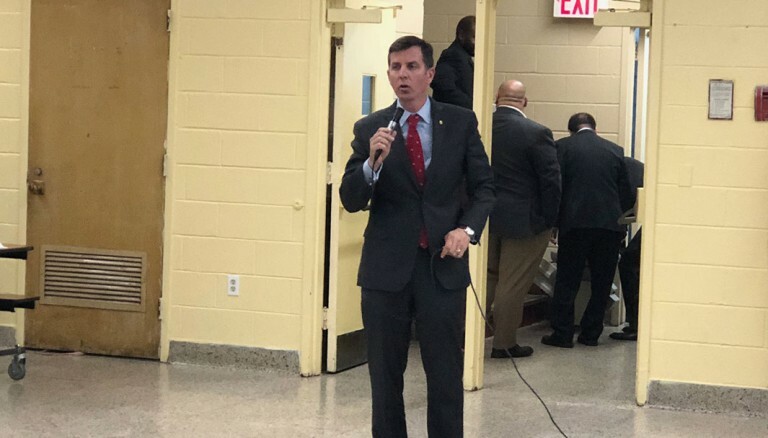 With just seven days remaining in races that will culminate in what pundits and pols on both sides of the aisle have breathlessly characterized as the most important Election Day in the history of the republic, incumbents and challengers on Tuesday evening delivered their final pitch to prospective voters at the Howard Beach Lindenwood Civic Candidates Forum. All four candidates from the two races with the most local significance made their closing arguments to a large, rapt audience at St. Helen Catholic Academy. Lindenwood native and resident Matthew Pecorino, a Republican running against incumbent Assemblywoman Stacey Pheffer Amato (D-Howard Beach) for the 23rd District seat, is winding down his first campaign—but he’s no novice. The Archbishop Molloy High School alumnus also laid out the three issues that he wants to immediately tackle should he emerge victorious Tuesday night. 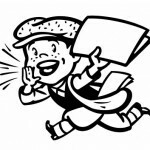 First and foremost: reform the property tax system. “It’s unfair and inequitable,” Pecorino declared. Next up: transportation infrastructure and the MTA. Pecorino said that the State, considering how much money it pours into Washington, D.C., is entitled to more federal transportation funding and it needs to start demanding a greater piece of the pie. Last, but not least: term limits for all. Incumbent Pheffer Amato said she’s running on her record over the last two years and her passion for public service. 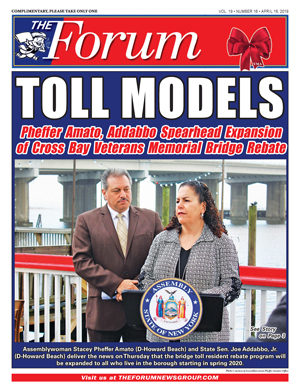 Pheffer Amato went on to highlight several pieces of legislation that she has carried in Albany, most notably her bill that would prohibit the imposition and collection of a fare, toll, rental, rate, charge or other fee on the Cross Bay Veterans Memorial Bridge that passed the Assembly, 133-0, in June. Breezy Point’s Tom Sullivan is running on the GOP and Conservative lines against State Sen. Joe Addabbo, Jr. (D-Howard Beach) for the 15th District seat. On Tuesday, the 25-year military veteran said that while he may be a political rookie, he knows what it takes to lead. Sullivan also noted that he believes that his civic experience in Breezy Point following Superstorm Sandy will help him get more from Albany for his prospective constituents. “My political philosophy has always been: If you want to represent the people of a community, you must have walked in their shoes,” the married father of three added. Addabbo, who has represented the residents and businesses of the enormous 15th District since 2009, said the proof is not in his politics, but in his ample record. Out of a possible 648 Albany session days, the Ozone Park native and resident has missed just two. Addabbo has passed 16 bills in the most recent legislative session alone.